Appearances: Referenced in "The Ribos Operation" but did not appear in person until "The Armageddon Factor"; manipulated events in "The Well-Mannered War", contacted Turlough in "Mawdryn Undead" and "Terminus" before confronting the TARDIS crew in "Enlightenment"; served as a partial ally to The Doctor in "The Judgement of Isskar" and "The Destroyer of Delights" before returning to a more obviously adversarial role in "The Chaos Pool"
Companions: K9, 1st Romana, 2nd Romana, Tegan Jovanka, Turlough, Amy; The Brigadier and Nyssa were involved in adventures featuring the Black Guardian, but the Black Guardian was operating ‘behind the scenes’ and they were never aware of his presence. History: Of all of The Doctor’s enemies, the Black Guardian is unquestionably the most powerful, being the personification of the fundamental forces of chaos and disorder throughout all of time and space, the counterpart to The White Guardian of Order. With his dedication to chaos and catastrophes, it was inevitable that the Black Guardian would come to oppose The Doctor, the universe’s greatest champion for the forces of good and justice. When The Doctor first became aware of the Black Guardian, the Fourth Doctor had just been selected by the Black Guardian’s counterpart, the White Guardian ("The Ribos Operation"), to search for the six segments of the Key to Time, an all-powerful object capable of granting the wielder complete control over all of time and space once all six segments were assembled. Although the White Guardian warned The Doctor that the Black Guardian would be just as interested in the Key as he was, The Doctor generally avoided any direct confrontation with the Black Guardian’s agents for the duration of his search for the Key - although he did speculate that some of his foes during this time, such as Hsien-Ko Chang ("The Shadow of Weng-Chiang") or Vivien Fey ("The Stones of Blood") might be connected to the Guardian, their powers were always revealed to have been acquired on their own merits without outside assistance -, the Black Guardian only becoming involved in the final stage of The Doctor’s quest when he, Romana and K9 tracked the sixth segment of the Key to the planet Atrios, engaged in a cold war with the planet Zeos. As The Doctor discovered, Zeos was actually inhabited only by the supercomputer Mentalis, designed by The Doctor’s old friend Drax after he was hired by the secret third planet - the ‘Planet of Evil’, ruled by the Black Guardian’s minion the Shadow - to create Mentalis, the Shadow having abducted Princess Astra of Atrios to question her about the location of the sixth segment. With Drax’s help, The Doctor and Romana were able to disable Mentalis, diverting the Atrion missiles that had been aimed at Zeos to destroy the Planet of Evil and the Shadow’s minions, Astra reverting to the sixth segment of the Key thanks to the Shadow’s actions, allowing The Doctor and Romana to depart with the completed Key. In a last attempt to gain the Key, the Black Guardian disguised himself as the White Guardian to try and trick The Doctor into giving the Key to him, claiming that he would ‘protect’ it, but The Doctor saw through the Guardian’s disguise when he showed no concern for the fate of Astra; the White Guardian would have ordered the segments to disperse in order to return the sentient Astra to normal. Casually informing the Guardian that it would be a shame to doom the universe because he was colour-blind, The Doctor activated the TARDIS’s defence systems and then broke the Tracer after setting the ship in motion, causing the six segments of the Key to disperse throughout time and space once again, restoring Astra to her old life. With the Guardian’s vow of revenge in mind, The Doctor then added a Randomiser to the TARDIS to feed random coordinates into the ship, reasoning that even the Black Guardian would never be able to find them if even he didn’t know where he was going (Although The Doctor ended up spending at least half of his subsequent travels forced to override the Randomiser to deal with a crisis he found himself facing, such as stopping Scaroth, last of the Jaggeroth, from wiping out humanity’s existence to save his own race ("City of Death") or to rescue Romana after she was captured and taken to Skonnos as a sacrifice for the Nimon ("The Horns of Nimon"), eventually disposing of the device). The Black Guardian eventually managed to ‘catch up’ with The Doctor in "The Well-Mannered War", when The Doctor and the now-regenerated Romana visited a colony in the far future, at a time when the White Guardian’s power was relatively limited, the forces of chaos approaching their peak as the universe began to decay to entropy. Having forced the TARDIS to effect an emergency dematerialisation to avoid crashing into the edge of the time spiral - and thus leaving the safety of the universe -, the Black Guardian simply waited as The Doctor, Romana and K9 investigated the human-Chelonian conflict on the planet Barclow, discovering that the conflict was being escalated by a third party in the form of the Hive, a colony of highly-evolved flies operating as a group mind and creating a cycle of death and carrion on Barclow for them to feed on. Although The Doctor was able to transmat the Hive into interstitial space so that he could safely dispose of it in the TARDIS, one of the Guardian’s minions was tricked into locking the TARDIS coordinates for the planet Dellah in the 26th century, the Black Guardian appearing to taunt The Doctor with the knowledge that he would have to either remain permanently in the Time Vortex or materialise on Dellah and unleash the Hive upon the galaxy. However, The Doctor thwarted the Black Guardian’s plan by operating an emergency cut-out unit that took the TARDIS completely out of time, where he was presumably able to dispose of the Hive safely before returning to the universe. Increasingly determined to gain his revenge on The Doctor, the Black Guardian nevertheless remained behind the scenes for some time until his next attempt to avenge the loss of the Key, his next attack taking place when The Doctor was in his fifth incarnation. Once again acting through agents rather than taking action himself, the Black Guardian made contact with the mysterious Turlough - apparently a young man attending a boarding school on Earth, initially seemingly remarkable only because of the fact that his maths teacher was The Doctor’s old friend Brigadier Lethbridge-Stewart, but later revealed to be an alien exile - when Turlough was briefly in a coma after a car crash, offering Turlough his life and freedom from his exile if he would kill The Doctor, who arrived on Earth near Turlough’s school while investigating a mysterious alien ship ("Mawdryn Undead"). Although he had several opportunities to kill The Doctor directly - such as hitting him in the head with a rock while he was examining the liner’s transmat pod -, Turlough was never able to complete the job, always halted by either his own cowardice or others interfering. Attempting to fulfil his ‘mission’ out of fear of the Black Guardian, Turlough joined The Doctor in his travels after the situation was resolved, only to continue to avoid taking the obvious option of simply killing The Doctor, attempting such indirect methods as sabotaging the TARDIS ("Terminus"). This continued until the White Guardian contacted The Doctor and warned him of an approaching danger, directing him to a set of coordinates where The Doctor, Turlough and Tegan became involved in a race among the Eternals - nearly omnipotent beings from the higher dimensions, but lacking the imagination and creativity to use their powers to their fullest extent -, the Eternals seeking to acquire ‘Enlightenment’ in the form of knowledge about the true nature of good and evil. Fortunately, The Doctor was able to take control of a ship crewed by Eternals who had allied themselves with the Black Guardian, winning the race himself - much to the Black Guardian’s displeasure, as he had been anticipating the chaos that the Eternals would cause with their new knowledge -, rejecting the offer of Enlightenment on the grounds that nobody was ready for it. Turlough finally fully renounced his old deal with the Black Guardian when offered a choice between finally killing The Doctor or claiming an enormous diamond, Turlough’s decision to reject the diamond in favour of The Doctor breaking his contract with the Guardian, although the White Guardian noted that his rival would seek The Doctor again in future. The Black Guardian returned to The Doctor’s life once again when The Doctor was recruited by the Grace - higher-dimensional beings that apparently existed beyond even the authority of the Guardians - to find the Key to Time once again, the segments having begun to decay and damage the fabric of reality after The Doctor’s use of a makeshift sixth segment disrupted the balance between them. Despite their past animosity, however, on this occasion The Doctor and the Black Guardian were forced to work together to find the Key, the powers of the Black and White Guardians weakening due to the damage that the decaying segments were causing to the universe around them. Forced to assume human identities in ninth-century Sudan as they sought the fifth segment - The Doctor and his new companion Amy (A sentient tracer created by the Grace) had acquired the first four already, and the sixth segment was a living entity whose removal would cause a potentially devastating temporal quake -, the Black Guardian became Lord Cassim of the city of Dunqulah while the White Guardian was the Legate of the Caliph - the most powerful symbol of Law on Earth at this time -, both sides having determined that this was the most likely location of the segment. Attempting to leave Earth, the now-powerless Black Guardian was forced to work with a treasure-seeking Djinn to repair its damaged spacecraft by providing it with gold that it could fuse together to create a shard of heavy gold, only for The Doctor and Amy to realise that the resulting ‘heavy gold’ was the fifth segment, paradoxically created as the Guardians searched for it. Claiming the segment, The Doctor and Amy departed in the TARDIS, leaving the now-powerless Guardians to their own devices ("The Destroyer of Delights"). However, the two Guardians were able to escape their ‘prison’ thanks to the actions of Zara, another sentient tracer who rescued the White Guardian to help her find the last segment, and Romana, who discovered the TARDIS after it was ejected from a spaceship and tracked back through its recent destinations to try and find The Doctor, only to be captured by the Black Guardian when her presence restored enough of his abilities due to Romana herself now being the sixth segment of the Key. Eventually, the two Guardians confronted The Doctor once more at the Chaos Pool - a legendary location where the Key to Time could be destroyed -, The Doctor refusing to hand the Key over to either of them, concluding that the White Guardian’s fixation on obeying the letter of the law would make him just as dangerous as the Black Guardian, the Key giving the White Guardian the power to eliminate freedom just as it would give the Black Guardian the power to destroy order. As The Doctor completed the Key - the essence of the sixth segment being drawn out of Romana and returned to Astra, who willingly sacrificed herself to save her old friend -, the Grace manifested from within the Key itself, banishing the two Guardians back to the howling Void so that they could continue their struggle, neither one able to claim the Key themselves as their powers were too evenly matched and Zara and Amy both refused to help either. 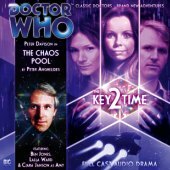 With The Doctor now holding the Key, he leapt into the Chaos Pool, destroying the Key and dispersing the Grace throughout eternity ("The Chaos Pool"). Given the Black Guardian’s more reasonable, compromising personality in these appearances - to the extent that he actually helped The Doctor find the fifth segment despite their old animosity, albeit for his own purposes -, combined with the White Guardian’s disregard for the rights of sentient beings where The Doctor once believed resolutely that he would never do such a thing, it would appear that the entropy damage being caused to the universe had the side-effect of causing the two Guardians to ‘blur’ in personality, each of them demonstrating slight aspects of the other’s attitude rather than the previously-portrayed division of the Black Guardian as an enemy and the White as an ally. Although the Black Guardian himself has yet to return in the modern series, echoes of him can be seen in Sarah Jane Smith ’s enemy The Trickster, a mysterious and powerful being who personified the ‘Pantheon of Discord’, seeking to cause chaos on Earth - preferably via a natural disaster such as an asteroid strike due to the pointless nature of such an attack - while apparently incapable of taking direct action himself. The Trickster’s favoured method of chaos in the series - although he may be capable of other methods - is to save people at the moment of their deaths under certain conditions, such as saving Sarah Jane’s childhood friend Andrea Yates from an accident when she was thirteen at the cost of Sarah dying in the accident instead ("Whatever Happened to Sarah Jane Smith? "), or rescuing lawyer Peter Dalton from an accident at his home so that he could go on to marry Sarah Jane, thus giving the Trickster an opportunity to make her forget her old life of defending Earth so that she could begin a new life with Dalton ("The Wedding of Sarah Jane Smith").